More a meal than a soup, this is all I need to eat to pep me up at lunchtime during the week. Finished with a good splash of grassy, peppery extra-virgin olive oil, it is unctuous and truly lovely. Drain the chickpeas, rinse, and place in a large heavy pan. Cover generously with cold water, but do not season. Bring to a boil over medium heat, then turn down the heat. Simmer gently for 1½ hours, or until the chickpeas are soft, skimming away any scum from the surface every now and then. Drain and dress with 1 Tbsp. olive oil and the lemon juice. 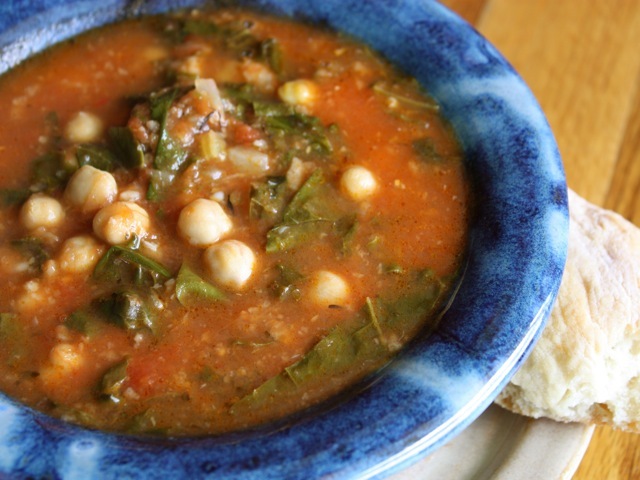 While the chickpeas are cooking, warm 2 Tbsp. olive oil in a separate pan over medium heat. Crumble in the chiles and add the garlic and rosemary. Cook for a minute or so to release the flavors, then add the tomatoes and stir well to break them up, adding a good pinch of salt. Cover and cook for 20 minutes, then pour in the stock and cook for another 10 minutes. Finally, add the cooked chickpeas and simmer gently for 40 minutes. Remove the rosemary sprigs. Toward the end of the cooking time, prepare the chard. Wash and pat dry, then strip the leaves from the pale central stalk, using a small sharp knife; set aside. Trim the stalks and cut into ½-inch chunks. Add these to a pan of well-salted boiling water and cook for 2 minutes, then add the soft green outer leaves and cook for another minute. Drain. Break the bread into small pieces and stir into the soup along with 3 ounces of the Parmesan, turning the heat to low. Add the chard and a drizzle of olive oil. Taste and adjust the seasoning. The soup should be deeply flavorful and thick. Add a little more Parmesan and/or olive oil if needed. Ladle into warm soup plates and serve. If, like me, remembering to presoak beans is beyond your usual level of organization, there is a way round. Rinse the beans, place them in a pan, and cover with cold water, then bring to a boil. Drain, return to the pan, and cover a second time with cold water flavored with aromatics or whatever the recipe demands, then cook as if the beans have been presoaked.